Road transport news in Scotland and the north of England centres this month on big topics… Firstly the annual Transport News Scottish Rewards celebration breakfast in Glasgow’s Crowne Plaza Hotel where 580 guests applauded 17 category winners including Scottish Road Haulage Operator of the Year. 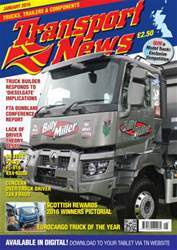 See the full pictorial and read all about Iveco UK boss Stuart Webster’s defence of diesel fuel, after VW blew it! 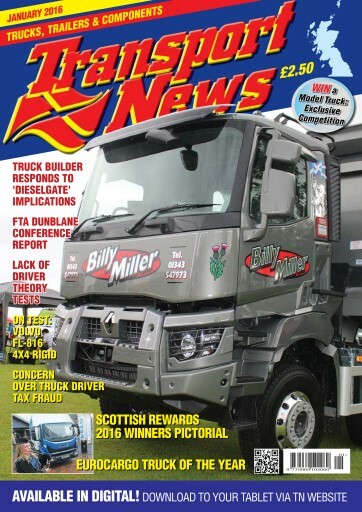 Full report from the FTA Transport Manager Conference at Dunblane, a look at Volvo’s version of tomorrow’s intelligent truck and the latest news on Michelin truck tyres – good news for the Dundee plant, but bad for Ballymena which faces closure due to a glut of truck tyres worldwide. Stena Line celebrates 20 years of Irish Sea freight, mainly accompanied. Did you know, we have fitted hyperlinks to advertisers’ websites. Just click their web address.